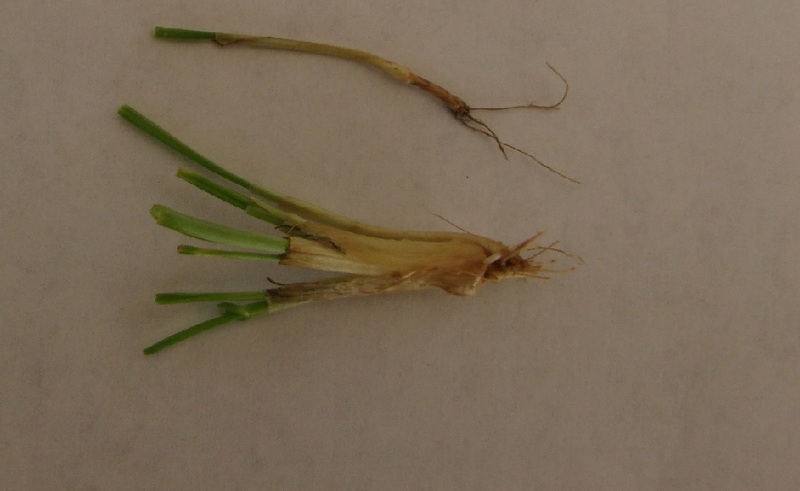 Unfortunately, checking a single or a few crowns does not tell the whole story as winterkill is often patchy across a field (Photo 2). To determine whether you need a plan B for these fields requires you to wait until the field starts to green up sufficiently in order to do a reliable stand count. The more protected areas will green up first, while bare knolls or lower lying areas where water or ice may have been present sometime during the winter and early spring will be slowest to green up. 1. Count the number of plants in a foot of row at several locations in the field. Take an average and convert in plants per acre using Table 1. 2. Take a hula-hoop, let it fall, and count the number of plants inside the hoop. Repeat this at random several times across the field and calculate an average. Use Table 2 to convert the count to an approximate population per square foot or acre. Table 1 - Average number of plants per foot of row for different row spacing and plant densities per acre. Table 2 - Adjustment factors to multiply the number of plants inside a hoop and convert the number into the number of plants per acre. Uniform stands of 17 plants per square foot or approximately 750,000 plants per acre are sufficient to keep and do not require a plan B. 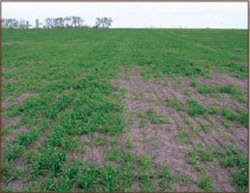 Consider replanting only those areas of the field where stands are below the threshold with, for example, spring wheat. No-till seeding HRSW into standing HRWW is possible but creates some challenges later in the season because the two crops will reach growth stages at different times and complicate not just harvest but also the timing of herbicides and fungicides.